Project a pulse of energy at an enemy. Restore health to yourself, modified by your heal bonus. Replenishes your mana for several seconds. Fly backward on a gout of flame that damages enemies near you. Create a burst of healing in front of you. All allies in the burst regenerate health for several seconds. 10 Lock on and restore health to nearby allies, modified by your heal bonus. After using your Shocking Implosion or Triple Nemesis skills, follow up with a blast of energy from your staff that damages nearby enemies. 12 If you’ve been knocked down, leap to your feet while attacking your target. Charge up the spell, then release it to restore some of your mana. 14 Produce an electrical burst in front of you. Lock onto several targets and put them briefly to sleep. 16 Instantly remove all harmful effects from several nearby allies. 18 Several allies near you heal their wounds over the next several seconds. Restore life to several nearby dead group members. 20 Boost the non-combat speed of you and your nearby allies. 22 Teleport all group members within the same province to your side. You cannot teleport group members who are in other provinces. 24 Instantly stands knocked-down group members and increases their knockdown resistance. Call up a plague that inflicts constant damage every several nearby targets. Against other players, the damage decreases, but their cooldown time for melee attacks doubles. 26 Heal several nearby group members other than you, modified by your heal bonus. You and your nearby allies receive a blessing that increases your strength. 32 Teleport yourself and group members nearby to the nearest campfire. 34 Increase the endurance of up to nearby allies, including you. 36 Nullify your aggro from nearby enemies. You and several nearby allies heal for several seconds, modified by your heal bonus. 40 Fires an energy bolt at a nearby enemy you select. The bolt damages the target, but it increases nearby group members' strength and attack speed for several seconds. 42 Cast a barrier that absorbs damage on several nearby allies and makes them immune to knockdown and immobility. 46 Increase resistance to all harmful effects for you and your nearby allies. 50 Decreases damage from distant enemies and increases your resistances to harmful effects. 56 Replenish a percentage of your health over the next several seconds. 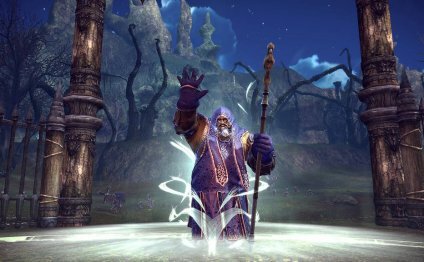 60 Grants a blessing enabling the Priest to resurrect immediately with 100% HP and MP. Lock on target within 19m and fire a healing light to restore HP (modified by your heal bonus) to all party members within 7m of the locked target. Press the s kill button once and mouseover to lock on the target, then press the skill button again or left-click to heal all targets.